I frequently have people calling me wanting a beagle that do not have a fenced yard. They comment that they live on a dead end street, 20 acres, or some other excuse. Beagles can roam for up to a mile square, that is about 600 acres, so if you live more than 600 acres from the nearest road MAYBE a beagle would be ok, but what about people that might be walking on your property and steal your dog, or other dogs that would come on your property and attack your beagle. For prospective owners that do not have a yard but live in an apartment or condominium; I suggest getting an older dog, maybe one that is close to a year of age. A retired show dog or rescue beagle may work better under these conditions. If you have a fenced patio or fenced porch, this area could be a "tiny secured" area for you beagle to spend relaxation time outside. My point is that beagles need securely fenced areas to play safely, or they need dedicated owners that will exercise them ON LEASH regularly. Now there are breeders that have pack beagles and spend tremendous amounts of time and energy training their beagles to remain with the pack, but the average beagle pet needs to be contained on a leash or in a SECURE fence at all times. You will notice I stressed SECURE fence, I did this because beagles are notorious escape artists. They will climb out, dig out, or whatever it takes to get out -if that is what they set their mind to do. Visit our page RX-For Escape Artists or Non-Visible Fences for more information on this problem. First, your fence must be sturdy and go RIGHT to the ground. A further barrier of concrete, landscape ties, or buried wire along the bottom to prevent digging, is a must if your dog will spend any time alone and unsupervised in the yard. A height of 4 feet is adequate for SOME beagles, while others have no trouble with getting over a fence of 6 feet. Since you won't know how 'talented' your beagle will become in the fence scaling department, I suggest you start out with the maximum you can manage. Another consideration is the 'view'. I prefer a solid fence that my dogs cannot see through. A 'fence with a view' invites your dog to bark at anything and everything that passes by the fence. Many dogs make a sport of it-fence fighting. Another thing to consider is double gating your yard or putting latches, snaps or even locks on the gates so that a gate could not be accidentally left open by someone. 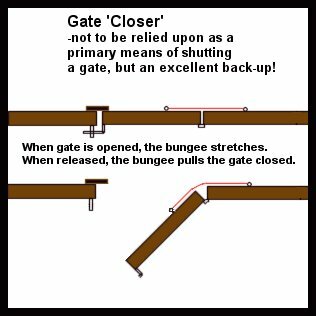 Also, using a bungee system to pull a gate shut can help prevent an escape. 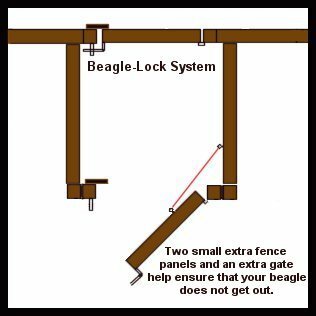 The bungee system IS NOT a replacement for securing a gate shut but will at least pull the gate shut so that your beagle will not see a wide open escape path. Teach your children and their playmates to always check to make sure a gate is shut. If they are too young to take this responsibility, then lock the gate and make the children come into the yard via the house. You should always teach you beagle to wait at an open gate and open door. Start young, when the beagle approaches the gate or door, tell him wait. Do not open the door until he is sitting quietly and then tell him "out" or "back". Since your beagle will always be on leash at this point, keep control and let him learn not to bolt out of the open gate or open door. Imagine the horror of having your beagle bolt out the gate or front door to only be hit by a car or to run off and never be found again. Believe me this happens far to often. Prospective owners question me as to why I try and have a "home visit" done by someone prior to a beagle living there; well this gives the person a chance to look over the yard and give suggestions on how to secure the fence, i.e. the amount of space under the gate, the amount of space between the house and fence. Some chain link fence post are a few inches away from a house due to interference with the house foundation. A dummy post is sometimes need in this space to stop a beagle puppy from squirming between the house and fence. These inspections are not to say your home is not safe but to show you ways to MAKE IT SAFER. Beagles are pack animals and want to be with another animal or with their humans. If you spend time with your beagle and allow him to be a part of your family, he will be less likely to want to escape. Remember -BEAGLES FOLLOW THEIR NOSES- if something is so interesting on the other side of the fence, bets are that MR. Beagle will try and find a way to investigate it!! BE SAFE, BE CAREFUL, AND BE SMART.